You can save money on containers for a cheap wedding candy buffet. When trying to make up a cheap wedding candy buffet, you'll need to save money everywhere you can. With some thought and preparation you can find inexpensive and even free containers if you know where to look! The first place you need to look for containers for your cheap wedding candy buffet is your own home. Scour your cupboards, basement, and attic for jars and containers. Look at large vases and decorative bowls you may have packed away. You might be using them for flowers or decorations but ask yourself, if they can be washed out thoroughly can they be used for your cheap wedding candy buffet? Your kitchen may have a wealth of options, if you're creative. As an example, notice our picture which is a custard dish with candy. If you have four of these, you can place them strategically around the table for a nice decoration. Drinking glasses can work for things like tall suckers or items that won't need a scoop such as Tootsie Rools. Wrap a ribbon around them to dress them up. Notice our picture. Another possible container for your cheap wedding candy buffet is a mason jar, as you can see in our picture. They're usually wide enough at the mouth for a scoop to fit. You might be using them on your counter tops to store pasta or flour, so consider emptying them and washing them out thoroughly. If you've gotten all the containers you can from your home, it's time to shop the dollar store. While you may typically opt for glass jars, remember that silver or white tins can work well for a cheap wedding candy buffet as well. Think of how you can decorate them with a wide and festive ribbon. You can also check secondhand stores and flea markets as well. Often these places are getting in new items all the time, so start early before your wedding and visit them more than once. 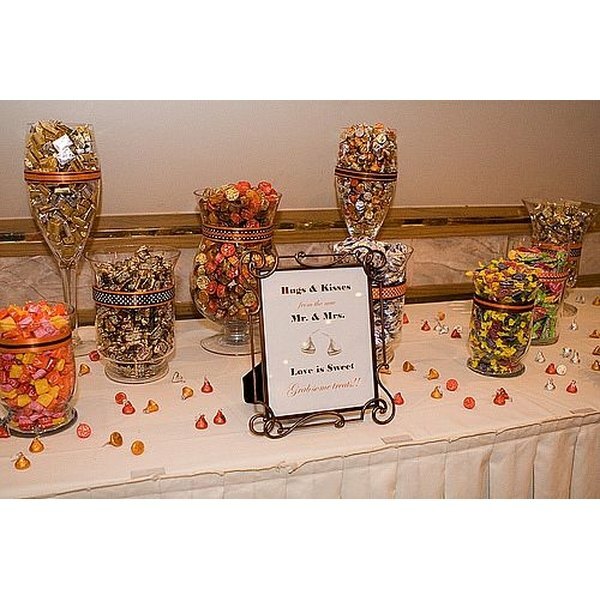 You may find a lot of options for your cheap wedding candy buffet for much less money than if you bought these containers new from a department store or party supply store. 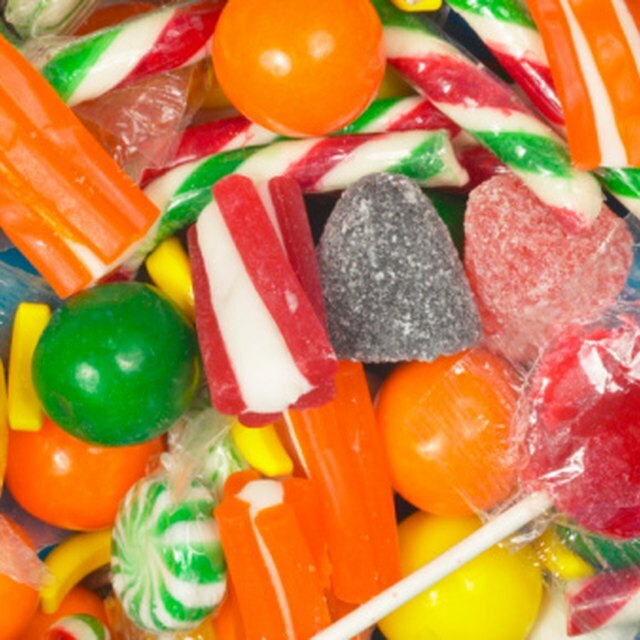 Be prepared to dress up your containers for your cheap wedding candy buffet with festive ribbon. Also, dress up your buffet table with a nice cloth or fancy scrapbook paper underneath the containers. Add candles, fresh or silk flowers, and framed photos of the bride and groom. These things will go a long way toward making your cheap wedding candy buffet really WOW your guests. Here are some additional suggestions for containers you can use for your cheap wedding candy buffet: ice buckets, clear or tin beverage tubs, salad and other serving bowls, wide mouth vases, fish bowls, the dome to a cake plate if turned upside down, chip and dip bowls, decorative bowls. You can also make up your own candy bar wrappers and wrap some Hershey bars for an added touch to your cheap wedding candy buffet.